Pop inn and see what*s perking at the newly built Hampton Inn and Suites Bakersfield/Hwy 58 with all the upgrades. A convenient stopover point on the way to Sequoia National Park Las Vegas or Fresno. The Hampton Inn - Suites Bakersfield East is located off Highway 58 and Weedpatch minutes away from dining shopping and entertainment options. and close to Bakersfield downtown country clubs and soccer fields in Bakersfield*s fastest growing business district. Let your checkered flags wave at the Famoso Raceway or the Bakersfield Speedway only a few miles from our hotel in Bakersfield. For a more relaxing time head over to Lake Ming or go back in history at the Kern County Museum or the California Living Museum. 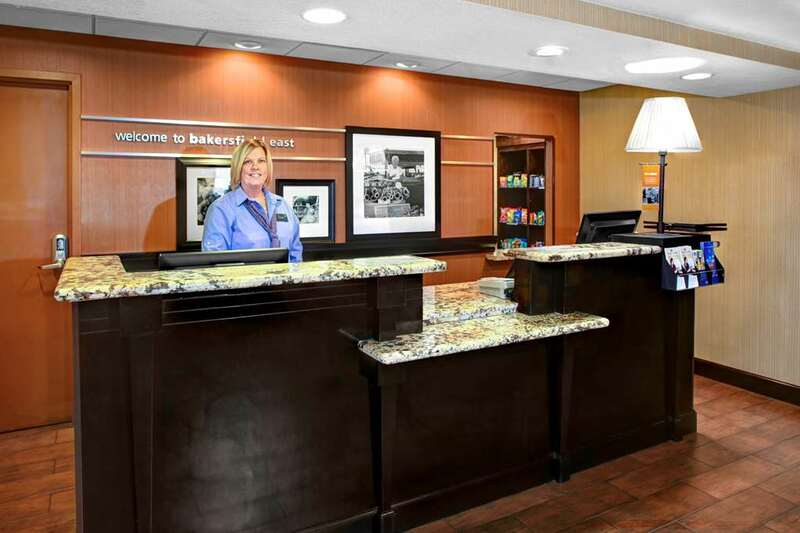 Our hotel in Bakersfield also puts you close to sporting fun at the Sam Lynn Baseball Park or exciting events at the Rabobank Arena and Convention Center. You can also whoop it up at the Stars Theatre or at the Buck Owens Crystal Palace featuring country music shows and a fine restaurant. For more tips on all the area*s sights and activities check with the friendly team at our Bakersfield/Hwy 58 hotel. Here at the Hampton Inn - Suites Bakersfield/Hwy 58 we*re passionate about taking good care of you. That*s why we offer a broad range of services and amenities to make your stay exceptional. We even cover the cost of your meeting space at our hotel if you book a group block of 30 or more rooms just one way of giving back to the community and our valued guest. Whether you*re planning a corporate meeting or need accommodations for a family reunion or your child*s sporting group we*re delighted to offer you easy planning and booking tools to make the process quick and organized. We look forward to seeing you at the NEW Hampton Inn and Suites Bakersfield/Hwy 58.